Shi'ite Muslim Hezbollah has a large armed militia that has helped Syrian President Bashar al-Assad in his eight-year war against rebels, but it is also a political party in Lebanon with seats in the parliament and cabinet. "Lebanon is within the siege that has been imposed on others, particularly on Iran. And it is passing, as a result of that, through a big crisis," Aoun told Russian media in Lebanon, the Lebanese Presidency office said. Sanctions against Hezbollah introduced since 2016 raised fears among Lebanese that U.S. correspondent banks might deem Lebanese banks too risky to do business with, harming a major part of Lebanon's economy. However, Lebanon's Central Bank has repeatedly said that the banking sector is fully compliant with sanctions and that foreign institutions are satisfied with how it implements regulation. "We don't expect more measures against the banks," Aoun, a Hezbollah ally, said. 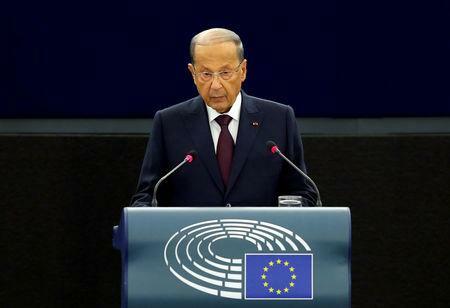 But he said the "negative impact of the siege on Hezbollah afflicts all Lebanese, as it does the Lebanese banks". "Every Lebanese bank has uncertainty about dealing with a depositor, fearing that he has a link with Hezbollah ... This mutual fear does not build an economy and sound trade relations," he added. Aoun is scheduled to visit Russia over March 25-26 after being invited by President Vladimir Putin, Aoun's office said.